Learn what a paper wallet is and how to use one. A bitcoin paper wallet is essentially a public and private key which are printed together. This wallet is a piece of paper that stores your funds offline in “cold storage” (extra-secure storage which does not come into contact with the hackable internet). 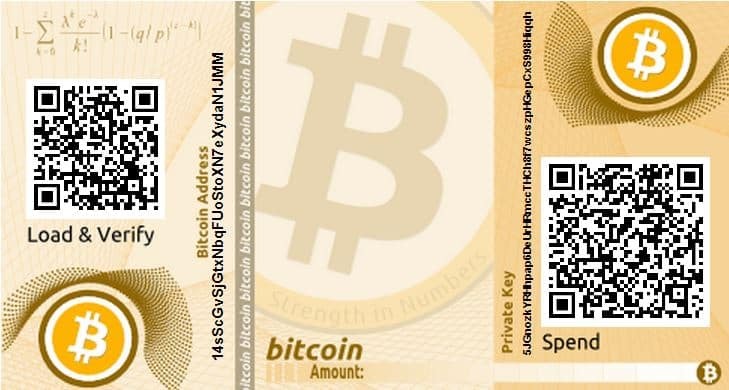 As suggested by the name, paper wallets are typically made out of paper, although they could also be made of any other material on which information can be printed for a given length of time. The paper wallet doesn’t store your money in the same way that a real-world wallet would do. Instead, it saves your public and private keys which are what you need to be able to send and receive money. A sample paper wallet. The QR codes are scanned to access the funds. Benefits and Drawbacks: Is a Paper Wallet Right for Me? Obviously, there are alternative methods to look after one’s cryptocurrency, with online wallets being the simplest and most effective alternative. The problem with online wallets is that you’re simply storing your key online on a server, which leaves you exposed to hacking. While desktop or mobile wallets can ease the worries in this sense, their problem lies in the fact that viruses and malware can quite easily penetrate these devices, thus creating security issues as well. If you were to stay in the offline realm, an alternative could be found by looking at hardware wallets. These can come in various forms, but commonly can be found in the form of USB sticks or external hard drives. These do require you to trust the company producing the wallets as they can potentially be logged. For this reason, used hardware wallets are clearly ones to avoid. Paper wallets, however, are particularly useful when it comes to security. They offer you complete control, as you are the one in charge of the paper. There is no exposure to hackers, malware, or hardware that can be compromised. If you have a particularly large amount of coins, this method is potentially the most secure one. On top of this, this method is inexpensive, so you will not have to look to spend vast quantities on security. However, there are certain risks to consider. First off, the most obvious problem is the fact that, ultimately these wallets are based on paper. This means it can quite easily be lost or damaged, so taking extra care of it is essential. On top of this, it can be stolen by an individual, who will have access to all your funds if he does manage to somehow capture the wallet. If no backup is made, it can be quite simple to lose this paper, at which point your funds are lost as well. Step 1: Find a computer free from malicious software (a new computer would be ideal, though this may not always be possible). Step 2: Find a trusted paper wallet generator. For example WalletGenerator.net or bitcoinpaperwallet.com. Step 3: Download the files on the site. Once downloaded, ensure that your internet is switched off to ensure there is reduced opportunity for hacking. Step 4: Open the programme. Generate your wallet by hovering around the highlighted text until the count reaches zero. Step 5: Your number should be generated, print off the paper (making sure your printer is not connected to wifi in this instance), delete the web page, and store your printed wallet in a secure location. The private key to your paper wallet is of utmost importance. You must guard it with your life, in the most secure way possible. If it is lost, your money is lost as well, and there’s no way around it. Anyone with the key can access the funds so it must be kept in the most secure location. If you have a safe, keep it there. That being said, it is also important to have backups, just in case something should go wrong. Have these backups scattered over multiple secure locations to ensure that nothing can go wrong. Offline storage is an essential part of security in an environment where it is extremely easy to be hacked. If you follow the security steps then you’re cryptocurrency is much more likely to be secure. While no method is foolproof, if you take the right precautions, the risk of losing your funds can be minimized to a great degree, allowing you for a more sound mind and more relaxed attitude.